Myanmar boasts many rich, diverse and untouched wildlife habitats, from the remote wetlands of Indawgyi Lake in the north to the mountains of Chin State – this tour, with dedicated local expert guides, will prove a true treasure trove for the dedicated nature lover. Arrive in Mandalay. After checking in at your hotel, visit the last royal palace of the Konbaung dynasty and recount the days of Thibaw and his queen, Supayalat, before they were expelled by the British into India. Visit the sacred Mahamuni Pagoda and receive a blessing for auspicious travels and then climb the 1729 steps up Mandalay Hill to be rewarded with a stunning sunset over the city. Fly to north Myitkyina and then drive to the remote Indawgyi Lake. The lake is said to have been created by a naga – a water dragon from Burmese folklore – and the birds that migrate here year-round from North America to Africa are the dragon’s children returning home. Take a kayak out on the lake and observe up to one hundred different bird species that include a large number of new indigenous species that were discovered in the last few years. Spot the rare Sarus cranes, plus a range of woodland and 90 wetland birds. Other wildlife includes a number of different types of turtle, a vast array of butterflies, as well as a number of amphibian species. Return to Myitkyina, the capital of Kachin State and a true melting point of ethnic groups in the north of Myanmar - as well as people from further afield, such as the city’s large Gurkha community; the riverside Strand is a bustling hub of activity with a colourful riverside market to explore. Spend a day sightseeing and bird watching around Mandalay and its neighbouring old capitals. The wetlands and rice paddies of the Mandalay area provide many opportunities to see dozens of bird species that include the Oriental Darter, the Eurasian Pigeon, the Pheasant-tailed Jacana and many more. The iconic U Bein Bridge, the longest teak bridge in the world, is a wonderful spot for wildlife photography. 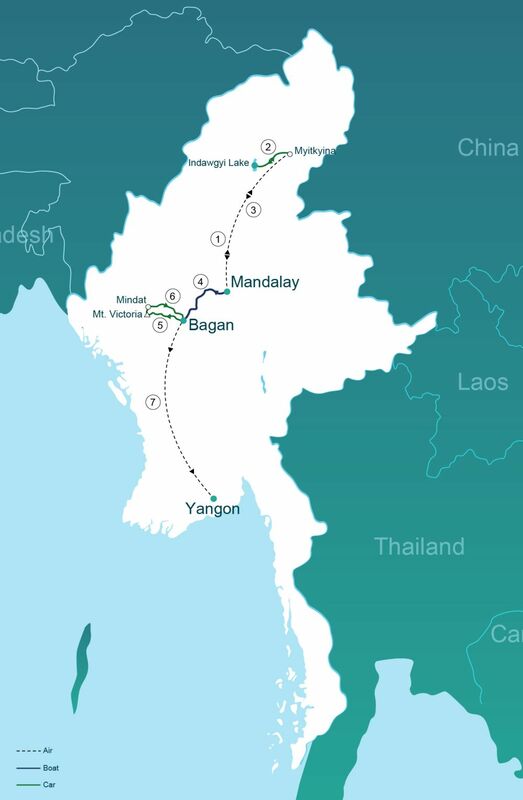 It’s an early start from Mandalay to Bagan, and it can get quite chilly in the early morning so come prepared with some warmer gear. Enjoy breakfast on the boat and take the leisurely trip past beautiful Irrawaddy riverside scenes. There are some quieter stretches on the water so this is a perfect time to catch up on some reading or write those postcards to people back home. Arrive in Bagan in time for one of its famously stunning sunsets. Drive 8 hours west of Bagan to the small Chin mountain town of Kanpetlet and wander around the simple homesteads and churches of this quiet rural backwater; you will stay at one of the eco lodges higher up the mountain. The next day you make the straightforward hike up Mount Victoria (known as Nat Ma Taung in Burmese or Khonuamthung in the local Chin language), witnessing beautiful mountain vistas and rare species of indigenous and migratory birds, butterflies and orchids and as you pass through evergreen, deciduous and pine forests, as well as hill savannah. Mammals in the area include tigers, bears, wild boars, leopards, serow and gibbons. After your climb, you will visit the town of Mindat, dramatically perched on a mountain ridge. Here, you will find members of the indigenous Dai, Upu and Ya tribes, of which the older womenfolk all have distinctive full facial tattoos. Explore the local market and mountainside villages and then return to Bagan for the chance to explore some more temples and enjoy some Myanmar wine over dinner by the pagodas. Drive back down from the mountains to spend some more time exploring the temples of Bagan. Fly to Yangon, a large and bustling city whose lovely parks are home to many bird species that include the little grebe, the bronze-winged and pheasant tailed jacana, the lesser whistling duck, the bee-eater and many more. Try out some sweet laphayet (Myanmar tea) at one of the many downtown teashops on your final day in the country; pair it with some fresh ee char kway, a deep fried dough snack that somehow is the perfect marriage. Walk it off by wandering the streets of downtown and there may be time for those last minute presents at Bogyoke Market before you head home. Would you like to extend your tour to the vast and untouched Myeik Archipelago or the beautiful and relaxing Ngapali Beach? Our travel advisors will be able to arrange this for you, along with any other travel, accommodation or activity requirements you may have. Just fill out the ‘Any further queries’ box after you have clicked on the ‘Book Tour’ button. Price per person based on two person tour (twin hotel room sharing basis). Larger groups will pay less per person, single person purchase will mean a higher price.